How do I open and edit Nikon D7100 RAW .NEF pictures? The Nikon RAW image format is Nikon Electronic Format (NEF). Photos taken in RAW mode are stored in files with the .NEF extension. With each new camera, the RAW data changes, and software must be updated accordingly to be able to read the file. The reason for this is that a RAW (.NEF) file contains the output taken directly from the camera sensor as well as the camera specific settings you use to take the shot. A new camera means a new sensor and new data and settings. If you try to open the D7100 .NEF file using a program made before the D7100 was released, it will not be able to understand the format. You have two basic choices: either update your program to a new version, or use a converter to change the format. The Nikon D7100 .NEF files can be opened using Nikon ViewNX2. D7100 support was added as of version 2.7.3 and 2.7.4 is the newest version out now. ViewNX2 allows only basic editing capabilities. You can use this program to save the RAW file as a TIFF and open in the editor of your choice (such as Adobe Photoshop). Nikon ViewNX2 is included with the D7100 or you can download it from Nikon. You can open and edit D7100 .NEF files using CaptureNX2 latest version 2.4.1. This commercial software allows advanced editing and high performance 64-bit compatibility for use on modern operating systems. Current CaptureNX2 users can update to the latest version with a free update. New users can download a 60-day free trial or purchase CaputreNX2 full version on Amazon, while owners of the previous version can upgrade from Capture NX 1.x. Adobe Lightroom 4.4 and Lightroom 5 and Photoshop CS6 support for Nikon D7100 RAW (.NEF) files as of April 3, 2013. Adobe Photoshop CS6: Adobe Camera Raw 7.4 You can open D7100 files with Adobe Photoshop CS6 with the newest Adobe Camera RAW plugin version 7.4. Earlier versions of Photoshop (CS5 and older) can not be updated to the newest Camera Raw version and will not be able to open Nikon D7100 .NEF files. You will need CS6 with the updated Camera Raw to open D7100 .NEF files. For earlier versions, use the DNG converter (see next item below). Adobe DNG Converter: You can convert D7100 NEF files to Adobe Digital Negative Gallery (DNG) format using the Adobe DNG Converter version 7.4. After converting to DNG format, you can open .DNG files with earlier versions of Adobe Photoshop and other programs that can read DNG format. Adobe Lightroom: Open D7100 RAW (.NEF) files using Adobe Photoshop Lightroom 5. You can also use Adobe Photoshop Lightroom Version 4.4. Lightroom versions before 4.4 will NOT read the D7100 RAW .NEF file. Lightroom 3 can not be updated to read the files. You must have the current Lightroom 4.x branch or use the Adobe DNG converter described above. NOTE: If you are still unable to open the D7100 .NEF files, make sure you are NOT using Nikon Transfer (standalone program) to copy the images. Old versions of the Nikon Transfer program can corrupt the D7100 .NEF files and can cause problems opening them. If you have files corrupted by Nikon Transfer, you can try this tool to fix them. In the future, copy the files using your operating system, or use the transfer function in the newest version of View NX2. I am sorry but this info is inaccurate. Camera Raw 7.4 and DNG do NOT open. NEF files from the Nikon D7100. We are dead in the water. I have the latest of everything plus a brand new D7100. This new format is NOT supported despite the claims that it is. Let me know work arounds if any please. What version are you using? In Photoshop CS6, go to Help->About Plugin->Camera Raw. Using the most up to date version of Camera Raw 7.4.0.137, I can open D7100 .NEF files without a problem. Also, using Adobe DNG conversion v7.4.0.137, I can convert the D7100 .NEF to .DNG and open in Photoshop CS6. My workround for the D7100 RAW problems is to leave the camera in the cupboard and go back to my D80 if I want to shoot anything but JPEG. Waste of time comment. what a joke… I would have sold might too I just would have never bought one. Old thread but still relevant. You can download Faststone free program, open .nef file, then save as tif and open in p/s or whatever. I am having the same problem that you are mwhat do we do??? You have to go to the converter in your Adobe parent file and batch convert the files, not in PS or Elements, at least I can’t. But at least I can get the files into a format that works now. I changed the camera from D7100 to D5200 with EXIFtools and did not work. The older vversion s of ACR will not open the file. This info is inaccurate in the last option given. That was an “old workaround” before ACR 7.4 was released. You still need a version of ACR that can recognize D5200 files. If you update to the latest ACR now (provided you are using CS6) you will be able to open the D7100 .NEF directly. If you’re not on CS6, you can use the latest DNG converter and then open the DNG in older Adobe programs. The problem for me is, shooting RAW is pointless if I can not open and adjust the image before converting. I wish my gear was stolen so I can get the insurance check, I would go back to Cannon and NEVER look back. I only went with Nikon because the local news paper editor told me people that send the most money expect to see Nikon. Funny, I have since run into Dayton and Columbus (Ohio) staff Photographers that use Cannon and make the big bucks. Many times my work is better because I take better images. (No thanks to my D90 or my D7100) I have been trying for years to get editing via PS CS6 or Nikon View NX2. I just downloaded everything yesterday and cannot open any file from my Nikon d7100 and I just got it on May 16, 2013. I made sure that it was supported before I bought it. Can someone please let me know what I could be doing wrong or if Adobe is messed up? Did you use Nikon Transfer to load the images, or did you copy the files directly? I am having similar problems. Yesterday, I loaded my first photos taken (all RAW) with my D7100. When I tried to work on them my ACR with CS5 would not recognize them. I did some research on the Adobe site. I downloaded CS6 on a 30 day trial basis, downloaded all the updates including ACR 7.4. Still didn’t recognize my RAW photos. Then I upgraded my Nikon ViewNX2, only went from 2.74 to 2.75. I then tried to use the Picture Control Utility on one of my D7100 NEF photos. This is where it really gets interesting. Nikon’s own program with a NEF photograph taken with a Nikon camera gave me the following error warning: “An invalid file has been selected. Only NEF images taken by a Nikon Camera can be used.” I have a question submitted on the Nikon USA site and I am awaiting an answer. Anyone here have any ideas? Thanks! How did you copy the files from the camera to the computer? If you used an old version of Nikon Transfer it might corrupt the files. Copy the files directly to your computer from the SD card, or transfer them by using View NX2. Im completely lost and need help. I’ve updated my elements 11 adobe raw to 7.4. I have RAW files on my computer and I can not figure out how to open them. I just updated yesterday, will they not open because they were imported before the update? Choosing the folder, then file, the open is greyed out. But when I click the open button in Elements, and click a .nef file that was previously opened somehow, it opens in adobe raw 7.4. Do I have to re import from my Nikon 7100. Should I uninstall elements and reinstall. I shouldn’t have to use the Nikon VIew NX2 to edit RAW files should I? I’m new to all this and am feeling at a loss with trying to open and edit my RAW files. It should be able to open the .NEF files if you have updated to ACR v7.4 or newer. If you copied using Nikon Transfer it may have corrupted the files. If you still have the originals in your camera or media card, re-copy them, or try the tool linked at the bottom of the post (see note in red). Typically, I use the card reader on my computer and transfer them using Nikon Transfer. The version is 1.52. I also upgraded that program this morning, but the upgrade version is only 1.53. I will try loading them directly from the camera. It can’t hurt. Thanks for the quick response! The Nikon Transfer program has not been updated since 2010, and I think it is causing your problems. It has been replaced by the transfer function in View NX2. You can use NX2 or just copy the files using your operating system. Your thinking was correct! Everything is working fine now. Thanks for helping me. I struggled a lot getting my d7100 raws converted. DNG Converter an camera raw 7.4 didnt work it and even view nx2 wasnt able to convert the .nefs. That is really annoying because i just got the d7100 new ant think that the supporting software should support it from the start. What helped was the last sentence. Instead of importing the pictures from the camera with nikon transfer i just copied them from the sd card on my hard disc…now view nx is finally able to convert the files…thanks god 😀 didnt try photoshop elements 11 and dng converter yet but i could imagine that they work too now… But i still not understand why the software that comes with the camera destroys the nef-files (i mean nikon transfer). Hi, I have been using Capture NX2 for all my RAW (NEF) file editing when using pictures from my Nikon D90. However, with my D7100 the RAW (NEF) files cannot be completely edited using all the features of Capture NX2. Please advise what I should do in order to get the full edit functionality as before. I have Nikon D7100, love NX2 2.4.7. version with NIK Pro Filters and have no problems with editing my NEF files. A tip for those who think that Adobe DNG Convertor 7.4.0.137 doesn’t recognise Nikon 7100 .NEF files, and are a bit dumb like me. You have to point the Convertor at a Folder containing the files, not at the individual files since those appear greyed out (on a Mac). I have a new D7100 and after successfully shooting jpeg pix, I am trying to shoot pix with both RAW (on slot 1 card) and JPG (on slot2 card). In the Shooting Menu I’ve set “Role played by card in Slot 2” to “RAW Slot1 – JPEG Slot 2” but can’t seem to find any recorded RAW ( .NEF) files on either slot 1 or slot 2 cards. I’m downloading the images from both cards with my windows operating system to my computer and it shows only .JPG files. Is there some other setting that might be preventing my 7100 from recording the RAW images? The .JPG images are fine, but I’d like to also have the RAW images for subsequent fine tuning. Any suggestions? You need to set RAW+JPG, the shortcut is hold Qual and spin the command dial. Or set it in the shooting menu under image quality. Thanx! Found it under Image Quality. Working fine now. Thanx for quick response. I got just the same problem!!! I set it using the menu image quality. So what is the solution? Shortcut method: Hold down the QUAL button and turn the command dial until you see RAW+JPG on the top LCD. You can also select RAW+JPG in the shooting menu under image quality. So, if one has used Nikon Transfer, and neither PS CS6/ACR8.1.043 nor DNG Convertor 8.1 are able to read them…how do I get them into a format that I can use in Photoshop? You can try using this tool to fix the corrupted NEF files. Thanks, I’m trying it now…will report back any news. That seemed to do the trick. Thanks so much for the link! My hubby just bought me the d7100 as a gift, i’m confused with all the functions at the moment, i used canon cam and im just new and learing about nikon d7100. My question is, i set my images file to RAW Fine and not sure if that’s the best I chose to get a very sharp image? RAW fine means you are recording a RAW image (.NEF) plus a JPEG of high (fine) quality. You can also set the JPEG size in S, M or L to determine the resolution. The size and quality only apply to JPEG. RAW is always full size and highest quality possible. I am happy that I found this in formation. I am still using CS5 (with the latest upgrade) and was surprised after I purchased my D7100 to replace a D200 that the RAW converter does not work. I downloaded the DNG converter from Adobe. Now I am trying to figure out if the upgrade to CS6 is more or less than a new external back-up drive is worth. Total drive space required for one photo (now) more or less is: 24meg for the NEF file, 42>5 meg for the DNG and 311meg for the PSD…. which is about 377.5 meg per photo, plus any jpg copies I make…. Anyone have any suggestions….. a new drive or an update of PS…..?????? I just bought the D7100 and have PS CS5 — which will not recognize my RAW files. Frustrating! I uploaded the Viewer NX2 but can only get it to convert the pixs into jpg or tiff to then open in PS. I can’t figure out how to get the RAW pixs into PS. I’ve tried following the instructions given to others on this page but I must be too dumb. Could someone please explain it to me again. Speak sloooowly! 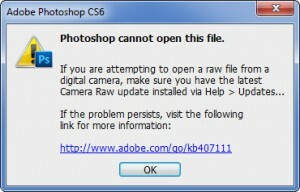 You won’t be able to open D7100 RAW files directly using Photoshop CS5. The workaround is to use the Adobe DNG converter to convert the .NEF to .DNG, then you can open in Photoshop CS5. hi, i recently purchased the camera. shot a few NEF pictures, some of them turned up to be keepers. transferred them to my mac book – could not see them with Aperture, could see them with Nikon s/w but cannot convert them in jpeg. upgraded ios, Aperture, camera raw. Now i can see new NEF files but i can still not see that first batch including the keepers! anyone who has solved this or thinking of another solution – anyone understands why this is happening even though mac is up to date and can read new NEF files? You probably used an old version of Nikon Transfer which corrupted the images. You can try using this tool to fix them. Curious if the purchase of the latest Photoshop and Lightroom programs would save me from all this DNG converter and ViewNX2 hassel and solve the issue of not reading the RAW files? Yes, Lightroom 4.4 or newer (including Lightroom 5) and Photoshop CS6 and Photoshop CC will all open the D7100 .NEF files directly. FIne, then what? I use CS5.6 – Can I use those TIFF files as RAW and manipulate them as usual? Or am I stuck to the TIFF as it comes out from ViewNX2? You could edit the TIFF but it is not RAW. To open a true RAW version in Photoshop CS5 you will need to use the Adobe DNG converter to change the .NEF RAW file to .DNG, and then open that as a RAW in CS5. Had the above problem with D7100 RAW files and PS Elements 12. Had used Nikon Transfer. Tried just copying the files from the SD card. Now can open them no problem. Best work around is don’t use Nikon Transfer. Hi There, i use ACDsee as my editing program, in the past is has had no issues with NEF from my D200, will it work with the D7100 please. Having problems with Nikon d7100 shooting in raw and using PS Elements 12. I just don’t use raw now because I can’t understand how to cure the problem. It takes all the fun out taking “pics”. JPEG can correct my pics almost as good as raw. I have a d60 along with a d5000 that will process in raw. Makes me want to store the d7100 which is to good of a camera to store. Suggestions?????? I have PS CS5. Will the DNG plugin work with it? CS5 does not support the new Adobe Camera RAW updates. You can use the Adobe DNG Converter. Well I downloaded the DNG plugin. Now I can’t open any of the RAWs I imported with iPhoto. I suppose this means I now have to rely on the clunky ViewNX for importing software. You probably need to adjust the compatibility settings in the DNG converter. Under Preferences/Compatibility set to an earlier version of Camera RAW or use Custom and set DNG to 1.1 or 1.3 and make sure Linear option is turned off. Won’t open at all now, says that my OSX no longer supports Windows platform programs. Getting seriously sick of this crap. Maybe a bit off subject, but has anyone compared the latest codec updates? Recently both Nikon and Microsoft released updated codec packs. Both have D7100 support and both are available for both 33- & 64-bit OS. (I’m primarily interested in 64-bit Win 7). Nikon acknowledges some compatibility issues with NEF files edited some versions od Capture NX2. I haven’t yet heard about the codec from Microsoft. I need to see & search xmp properties. A quick test of the Nikon 32-bit codec on unedited NEF files worked great. Just read all of the above comments and help and have not really seen a solution to my problem. I upgraded my PS Elements to 12 and can work on NEF Raw files no problem. My problem is the downloading. When I shoot Raw+Jpeg and then try to load to my computer I do not see a separate RAW file and separate JPEG. What I see is 2 RAW files. One is labeled correctly and the other one labeled the same but with a (1) attached. This occurs if I try to load directly to my hard drive or using the included Nikon software. If I shoot straight JPEG they show up correctly. Any ideas? Will Adobe ever make an update available for PSCS5 for camera raw for the NIKON D7100 as currently no one can use the camera raw program which i loved using in PS but now its completely useless i am not going to spend a furtune just to upgrade to CS6 —– will you ever make an update available or are you tell us users who just updated our camera who love to edit in Raw that we are just going to spend the extra money for CS6 which i don’t believe is fair —- all i see is people complaining and having issues with our brand new camera D7100 seems like ADOBE is trying to stick it to us bcs we bought this great camera and now want us to invest another $1000 into their editing software —– will you make an update for the d7100 bcs it is time consuming using the DNG program i would love to use the camera raw but now you have that useless….. Since 1984,I am a Nikoniyan, from Nikon FE2 to D7100 is my 7th Nikon Body. Not only me but thousands of other Nikon pro-customers are facing the same RAW file transfer issues. Why Nikon is not supplying any adequate tools with their new Bodies to support the inbuilt features? I have a Nikon D7100 and Photoshop CS6. I shot my pictures as RAW/NEF and I was able to upload them by updating the DNG Converter Camara RAW update. I already edited my first picture, but I need to SAVE the image as RAW/NEF and it is not letting me. When I click on SAVE from the File menu, it gives me all other options (jpeg, tiff etc) but I don’t see RAW or NEF anywhere! Hi. As you found, you can’t save edits in RAW. That format is the raw data from the camera. In Photoshop you’re not actually editing the RAW file data but making an interpretation of the original data. When you open the file in Adobe Camera RAW it creates an .xmp file that saves the presets you use. Then once you get the file into Photoshop and make edits, you can save it using PSD or TIFF. I just upgraded from the D90 to the D7100 and have recently just started shooting in RAW. I am trying to convert my NEF files to DNG files to edit. I use PSE 9. I have downloaded DNG converter version 7.4, Camera Raw 6.5 and also the software that came with the camera – View NX 2. None of this is working. What am I supposed to do to open my NEF files so I can edit them?? Please advise. DNG Converter 7.4 or newer should work. However, if you use the old Nikon Transfer to copy the files to your computer it may corrupt them. Please refer to the note in red at the end of the post, it explains the issue and a link to a program to fix your .NEF files. In the future, copy the files directly from the card or camera using your operating system. I bought a used D7100 purchased new in Feb, ’14 and have the same issue. I downloaded the latest DNG converter but one of the files would not open in Photoshop Css5. How could nikon miss this important authoring of its own raw images? The more I think about it, the more I wonder if I made the right choice on camera maker. Lets hop new 7100 software comes up soon to fix this and other issues. Check the compatibility settings in DNG Converter. Change Preferences-> Compatibility. Set to Camera RAW 6.6 or later. If it’s set to Camera RAW 7.1 it won’t work in CS5. Are these files damaged ? Df support was added in View NX2 version 2.8.2, try updating if you do not have at least that version installed. It is also possible that Nikon Transfer corrupted the images, if the above does not fix the issue, try the Fix NEF tool linked at the bottom of the original post. Been through all this with my D7100. Raw files will not open in IPhoto in Mac but also have a PC and Elements 13 will open the RAw files. (But, of course, you now have to buy a new version of Elements. Hope this helps. This is an appalling state of affairs. Nikon and Adobe should be ashamed of themselves. I am an Adobe Creative Cloud subscriber (all software is up-to-date), a Nikon D7100, an iMac Retina 5k, 27inch, 3.5GHz Intel Core i5 running under OS X Yosemite 10.10.1 (decent up-to-date equipment) and I have 40 years of professional experience in computing and at least the same length of time as an enthusiast in the field of photography and I am losing patience. I have tens of thousands of images which I need to ‘look after’ and keep secure, never mind the issues in opening new RAW files. Legacy versions of images need to be maintained so that they can be opened in the future, but the complexity is becoming untenable. To DNG or not to DNG – To TIFF or not to TIFF – BUT how do I open the legacy RAW files? My 2014 Macbook Pro 13″ has a card slot built in. Further…. CS6 has a raw photo plugin that will act as if the image is Raw. Save all documents that are associated with the image from the beginning in an archive so if you want to go back and re-work the image you can. I save as uncompressed TIFF for iPhoto. I can’t seem to find the Camera RAW 7.4 plugin. When I search for it, the DNG Converter 7.4 shows up and not the plugin. I am kinda confused! Help, please? The Camera RAW plugin and DNG Converter are in the same update. the bottom line is Adobe sux. I have no issues with Corel paintshop. Thank you on your help. Adobe DNG converter did a trick with adobe photoshop cs6, with raw files shooted from mine Nikon d5200.